My grandfather, a country doctor in north China, became the first Christian in our family through a CIM missionary. Later, he also became the first member of my family to suffer persecution when he was tortured to death during the 1947–48 Communist land reform. My father, the eldest son, graduated from a Christian high school just as the Japanese army invaded north China. He was severely beaten by Japanese soldiers for helping the church provide food and shelter to Chinese refugees. 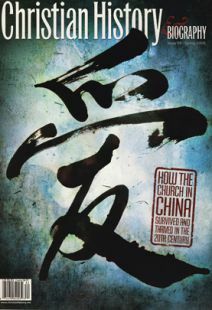 He made his way to southwest China, completed seminary training, and was ordained. In 1954–55, when the government closed most churches, my father was denounced for propagandizing “spiritual idealism” and our family was given a “black” label, meaning we were to be totally ostracized. My mother divorced my father and left me at age five. Forced out of the parsonage, we lived in a shack at the back of the churchyard, which became a factory. Father was forced to do hard labor for the next 25 years. My only childhood memory is being hungry all the time. As a young boy, I could only see that my family was responsible for my being bullied at school. When the Red Guards were sent out of the cities to the countryside, I volunteered to go. In November 1968, 12 teenagers arrived in a very remote mountain village. Working hard 12 to 14 hours a day, we barely survived. Since my father was a “criminal,” I was usually alone. Many times, I sat on top of a mountain watching the sheep and wishing I weren't alive. I kept up my hope for the future by secretly reading anything I could find. After I managed to leave the village to work in a factory, I studied even harder, but still in secret. After Mao died, college entrance exams were resumed. I passed, despite very sharp competition and only an eighth grade education. Deng Xiaoping’s policies allowed us “black” elements to find a way back into society. I was even recruited by the Communist Party. I always blamed my father for my troubles. Only after I was married, finished school, and had a good job did I reconnect with my father and his family. While I was a visiting scholar in the U.S. in 1990, he came to live with my wife and son. I visited churches everywhere I went and stood quietly observing how the Christians behaved. I could see they freely chose to believe, and many helped me without knowing a thing about me. I began to rethink my father's life. There was a stark contrast between June Fourth and my father—who never argued, never cheated, was always patient and kind, and was respected by all who knew him. I realized Marxism has no words to address a person’s individual needs. Where does love come from? Where do goodness and evil come from? I enjoyed reading the Bible's answers to all these questions. God began to be real to me. One special day I visited a Christian scholar who shared words from the Bible as a personal message for me. I was filled by the Holy Spirit as God spoke to me. I was so happy that I cried. A Communist with a heart of stone never sheds tears! Then I knew that the only explanation for my life's journey was that God loves me, gave me my father, and was blessing me today through this stranger. I humbly accepted Jesus Christ. I decided I had to use my knowledge and life experience for God, not for myself. I would serve God, not the Party. The U.S. didn't need more Christians, but China did, so I would return to China. When I saw my father, I immediately told him, “Now I’m a believer.” He smiled and said, “I have prayed for you for 30 years.” I realized I loved and respected my father because he lived his whole life true to his belief. Happily, my son loved his grandfather and respected my choice. So when he went overseas to university, he immediately was baptized and joined the church. He has become the fourth-generation Christian in our family. The author’s name has been withheld to protect his identity.